Over the summer we headed up to Canada for a rare family gathering. My aunt and uncle own a huge old farmhouse up there and the original plan was for them to get up their early and fix it up for my Aunt's 70th birthday party. My cousins were coming, and sister and brother's family, all the relatives who weren't working or, sadly, in the hospital. Unfortunately the wack-a-doodle tenants refused to move out until ordered to by the court, finally leaving one day before the sheriffs were due to arrive, but we all came anyway. We don't need no fancy house to party. Check it out over there, 26 rooms including 5 bathrooms and 3 kitchens (it had been turned into apartments). 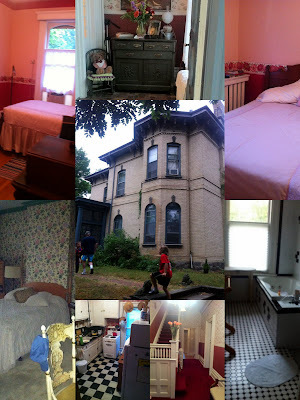 Their plan is to restore it to its Victorian glory and run a bed-and-breakfast. They've started on a few rooms, but the place looked cool to me, even the spooky attic, which instead of being full of priceless antiques contains old computers and printers, of course. The best thing about this place, though, are the two gorgeous decks and a front yard the size of a soccer field. Except when we left the house, or they were exploring the many many rooms, the kids pretty much never stopped playing on this grass. As cool as this house was, and how fun to have enough space to have an entire party outide, but enough rooms to sleep 20, I'm not aiming to buy a house this big. The idea of redoing a house, furninishing it, redoing the kitchen and bathrooms then inviting (paying) guests over really appeals to me. It's pretty much my husband's worst nightmare so a B&B is not in the cards. I hope at least to visit again. I also can't end this without a few photos of my adorable neice and nephew, who I got to meet for the first time this summer. That's uncle court, aka my dad, aka world's best grandpa, holding the baby there. This post was inspired by the latest book in the Left to Write book club. Carry Yourself Back To Me is about singer-songwriter who's going through some tough times and starts out holed up in her house in Florida, snuggling with her dog and sanding down every piece of furniture in the place. A lot of the first of the book is spent describing parts of the house. Although I found it a bit too chock-full of metaphors or similes, by the end of the book I was in tears and rooting for this chick to reconnect with her family, her past love and mostly her music. Deborah Reed's debut novel Carry Yourself Back to Me follows heartbroken singer-songwriter Annie Walsh as she digs into the past to exonerate her brother from murder. As a member of From Left to Write book club, I received a copy of this book for review. You can read other members posts inspired by Carry Yourself Back to Me on book club day, September 22 at From Left to Write. Re-connecting with family can be thirlling or gut-wrenching...there doesn't seem to be a middle ground. What an amazing place! So glad you had a great time and loved the photos! I like the idea of a large house, just like you. It's the practical side of things that I don't want to deal with, like dusting! Looks like you all had a beautiful visit. What a wonderful old house and great family pictures! I love to stay in places like that but I could never do the "breakfast" part of the b & b thing. I am not sure where you are from but in Cape May, NJ, if you own a house down there you are pretty much forced to turn it into a B & B in order to keep it, the upkeep is just that expensive! Especially being on the shore where the salt air peels your paint every two to three years and you are forced to completely redo the exterior! If you ever have the chance to go there, I would highly recommend this town an all of it's Victorian treasures! What a fantastic family house. Lucky you! I would love to have a place like this for my whole family. The closest thing we have is in West Virginia where my mother is from. There's the family cemetery, which dates back to the 1700's, and the old farm house my great grandparents lived in that is now occupied by a 3rd cousin. In any case, it holds a lot of memories and my extended family goes every year to visit. I hope to join them soon. I'm so glad you enjoyed the book and that it inspired this lovely family place and time for you. As for the metaphors and similies, I know. I'm a bit of a southern writer and that just seems to come with the territory. Thanks so much for reading and for sharing these pictures and your family with us. I love big old houses! We live in an old house (not big--we only have one kitchen ;) and all the "charming" parts make it a lot of fun. The charming parts also make it a lot of work, but I guess I can't have it both ways, right? Ooooh I love Victorian houses! It must be a dream to stay there. I agree with you though, can't even imagine all the work going into a house that big, not to mention how expensive utilities must be! But, at least as a guest you won't have to worry about that, ha! Working mom, soccer mom, marketing professional and of course a mommy blogger.